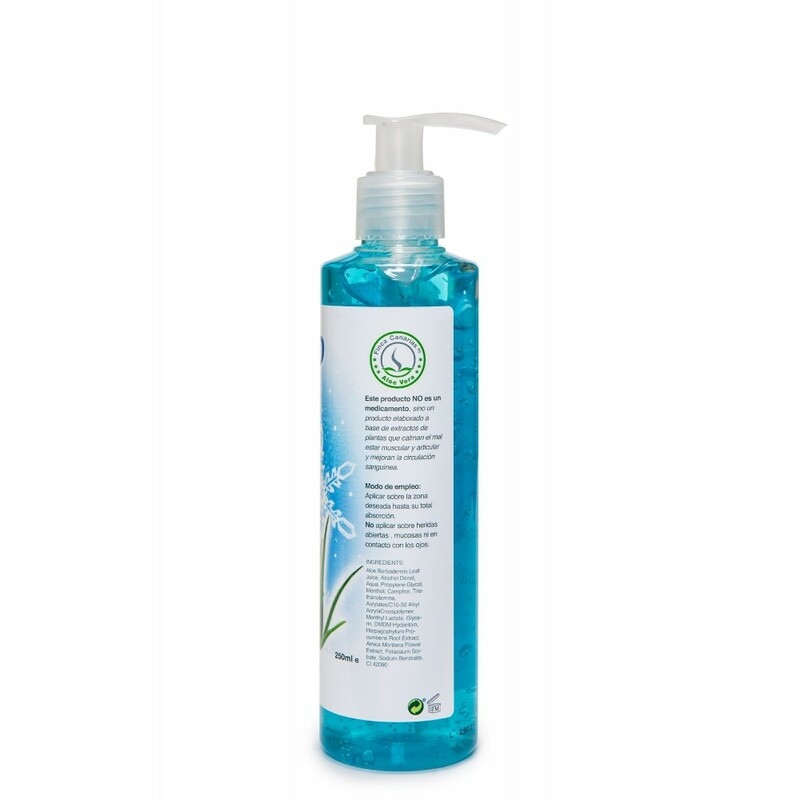 Extra powerful Cool Gel based on Pure Aloe Vera Juice, Devil's Claw, Arnica and Menthol. This new formula has three times more active ingredients than the standard cool gel, so it has an amazing anti-inflammatory, analgesic and regenerative effect. Recommended for relieving pain caused by diseases like rheumatism and arthritis. It reduces the inflammation of muscles and joints, releases muscular tension, promotes the circulation of blood and helps to recover from injuries and muscular efforts. Aloe Vera is considered the best regenerative remedy in nature. It goes deep through three different skin layers, showing an efficient driving power, carrying other substances into the deeper skin layers. Devil's Claw is a natural root original from South Africa, considered the best natural anti-inflammatory remedy. It reduces pain and inflammation without side effects. Arnica is an anti-inflammatory and vasodilator plant, used to relieve sprains, strains and bruises. The cool therapy relieves pain by slowing down the rate at which pain signals are sent to the brain via nerve endings and by providing an alternative stimulus to the brain other than the painful stimulus from the injury. In addition, it causes blood vessels to constrict, therefore reducing blood flow from damaged vessels. By reducing blood flow it decreases the amount of swelling in the injured part. It cools the tissues, which reduces the inflammatory chemical reactions. By slowing these inflammatory reactions, cool therapy decreases 'secondary cell destruction' which is the death of cells surrounding the injury that weren't directly damaged by the initial injury. This restricts the tissue damage to the smallest possible area. In addition to all this, our cool gel will soften, moisturize and soothe your damaged skin, stimulating its natural regeneration. Finally, the menthol oil contained in this product has similar analgesic properties that the ones shown by acetylsalicylic acid. It also provides a pleasant feeling of freshness and a powerful stimulating perfume. That is why is very efficient when used for clearing a cold nose or relieving a headache. The combination of these four powerful natural elements make from this cool Gel a powerful analgesic and anti-inflammatory remedy, that goes deep into the skin. It is an ideal remedy for relieving pain caused by strains, sprains, herniated discs, low back pain, rheumatism and other diseases resulting in muscle or joint pain. It is also used to improve the circulation of blood, so it is ideal as a tired or heavy legs remedy. Apply a little quantity of this cool gel uniformly on the outbreak pain, extending with a light massage , preferably on clean and dry skin. In case of acute pain, it is recommended to spread a thick layer of cream on the pain focus and stay calm for at least 20 minutes in order to obtain a better analgesic effect. We recommend to apply it cold to increase its anti-inflammatory power. Suitable for external use and body . Avoid contact with eyes and sensitive areas. Menthol can irritate the most sensitive areas. Two applications a day is enough to regenerate and relieve muscle and joint pain. Not indicated for use in children under 3 years old, because of its content in menthol. All our products contain Aloe Vera Pure Juice, pressed in cold, so it is recommended to store this product in the fridge once opened. In addition, when applied in cold, the refreshing and analgesic effect will be increased.